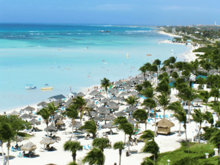 The Way to Happiness’s precepts are turning the island of Aruba into a safe haven. Last Christmas season, with The Way to Happiness public service announcements airing throughout Aruba on TV, traffic fatalities on that Caribbean island dropped to zero. A tourist island of beautiful sand beaches, Aruba is known for its vibrant nightlife and that nightlife’s worst side effect: drunk driving and the consequent fatalities, which is exactly why Aruba has opted to use The Way to Happiness. Its booklets, public service announcements and DVDs are delivering Aruba results. Written by American author and humanitarian L. Ron Hubbard, The Way to Happiness is a common sense guide to better living. Through its 21 precepts, people from all walks of life gain a practical moral compass to achieve a better life. Daily airplay of a public service announcement based on The Way to Happiness precept “Be Temperate” began in December 2009, showing on all three Aruba TV stations. By January, drunk-driving fatalities dropped to zero. And along with alcohol abuse, other related crimes, like sexual assault, declined. The Way to Happiness Foundation has delivered seminars based on every precept of the book to officials and other guests of Aruba, and 240,000 copies of The Way to Happiness booklets have been distributed throughout all islands of the Caribbean. Now the campaign has expanded and yet another precept from The Way to Happiness is creating change in Aruba: #12—“Safeguard and Improve Your Environment.” The precept is fostering eco-consciousness among the island’s citizens, and Aruba has focused on community cleanups to carry out the message. One girls softball team conducted a clean-up of Aruba’s second largest city, San Nicolaas. The effort was covered by Tele-Aruba, one of the island’s major TV stations and featured by a local radio station. In came a flood of requests for The Way to Happiness booklets. With the island so taking to heart two of the book’s precepts—“Be Temperate” and “Safeguard and Improve Your Environment”—there await infinite opportunities in the remaining 19. The Way to Happiness Foundation will continue working hand-in-hand with Aruba officials and the island’s social betterment groups to ensure that the full message of The Way to Happiness is broadly known and used there by all its people. It has already begun to assist them in leading safer, happier lives. To learn more about The Way to Happiness Program, order your FREE Information Kit.